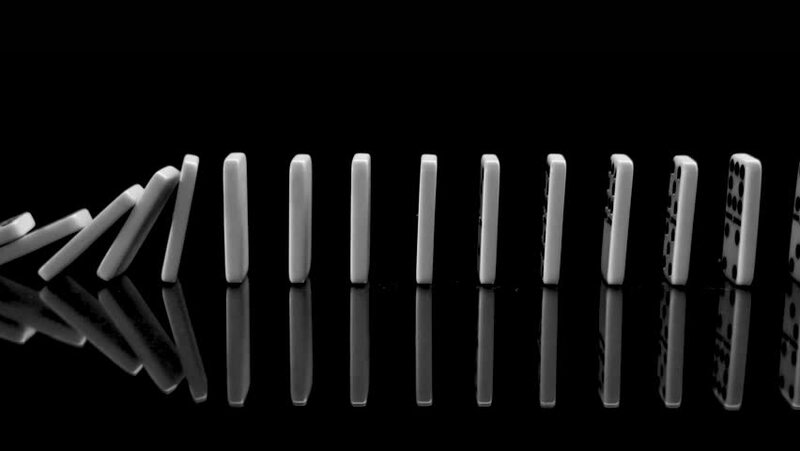 Close tracking shot of white dominoes falling in a row in slow motion from left to right. Camera moves sidewards from left to right. hd00:12Medium shot of white dominoes standing in an s-curve. The stones are falling in slow motion from left to right. hd00:09Medium tracking shot of white dominoes falling in a row in slow motion from left to right. Camera moves sidewards from left to right. 4k00:07Row of matchsticks on the gray background in the studio. First of them is whole, others burnt of different intensity. Lighting is changing from bright to dark and shadows are moving. 4k00:07Group of matchsticks on the gray background in the studio. First of them is whole, others burnt of different intensity. Lighting is changing from bright to dark and shadows are moving. hd00:11High Definition CGI motion backgrounds ideal for editing, led backdrops or broadcasting featuring a seamless loop of white blinds. Great for keying or masking!